So, it has been a long time coming (more than 2 years now), but my photo wall is officially up and I thought I'd write a proper post about the process. 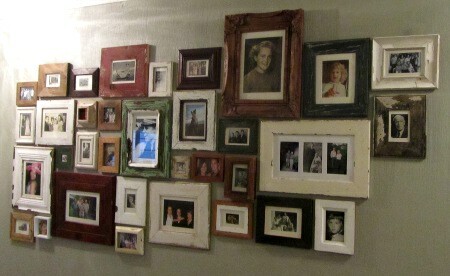 I'll admit when I first started collecting the frames, which started long before I thought about what photos would fill them, I also didn't give much thought to the process of getting them up on the wall. Luckily when I was almost done, I found something on pinterest showing me the perfect solution to this. 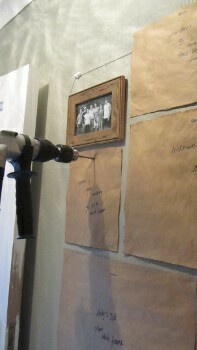 First I had planned where on my new wall the photos would go. This is the entrance wall in my new house. The electrics box is hidden behind the front door when it's opened and this wall leads all the way thru into the lounge. The kitchen is directly opposite, so some of the photo are now visible from just about everywhere in the house (except, obviously if you're actually inside either of the bedrooms or bathroom). I left the string up, demarcating the area for quite some time, just getting used to the space (there was another potential wall for the photos to go, but this turned out to be the perfect fit). The trick to doing this is buying a few rolls of brown paper from any stationary store. 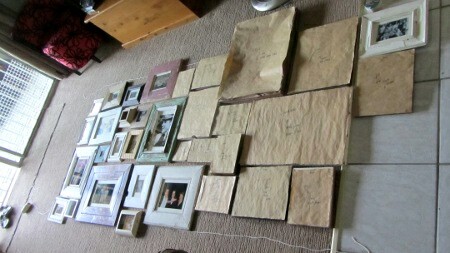 Then you take all your frames and trace them onto the brown paper and cut them out. I wrote on the front what the photo was, if it was colour or black&white and what colour the frame was too (so I could tell what they were for because I have 34 frames!). Then I place the paper cut-out against the back of the frame and used a permanent marker to trace where the keyhole was (most of my frames had keyholes for hanging), so that I could see thru the brown paper where to drill the nail. This is quite a tedious process, I won't lie. Then I started trying to place my cut-outs on the wall with prestik. Although this felt like instant gratification (seeing the space my frames would occupy), it turned out to be a completely ineffective start. I couldn't place them easily and ended up with some weird gaps. Also they were all brown paper so it was harder to visualise the end result that I thought. 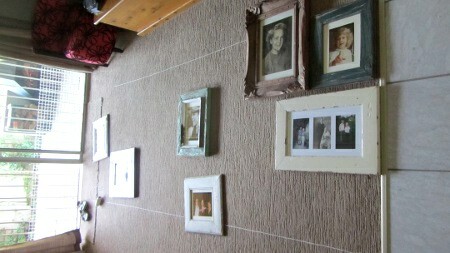 My next solution was to mark out the exact same space on the wall, on my lounge floor and place the actual frames. This turned out to be a much better solution, I could easily visualise the end result because I was looking at the actual frames with their photos. And obviously placing the tangible frames made moving them around and fitting them together an easier process to get right and have fewer gaps (with mismatched frames, it's virtually impossible to have no gaps at all). 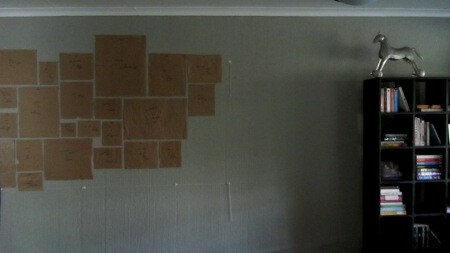 Once all the frames were placed on the floor, I covered them with their brown-paper cut-outs. This was handy to ensure they all actually had markers (3 didn't) and it helped me take them in order as I started to actually re-create the layout on the wall. I absolutely *love* the end result. I've gotten used to it now, but I couldn't stop staring for the first few days. I've chosen family photos, it's become a sort of family-tree wall :) The tricky part, of course, will be adding to the wall (like with The Peeb's wedding photo later this year), which is part of why I waited till I had so many frames before hanging it in the first place (that and I never lived in my own home so it seemed silly to put the effort into somewhere temporary before now). 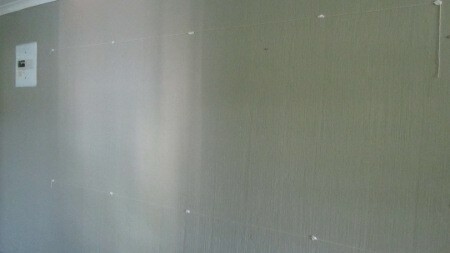 I think it'll be okay tho, the edges are uneven and there is still space on the lounge side of the wall ... Sadly tho, it's tricky to photograph effectively (the one below was taken in the evening after we'd finished hanging them), but this should give you a good idea :) I haven't had anyone over (except The Trucker and my Mom & The Peeb) since it went up tho, am dying to see how people interact with it ... some of the photos are really small and you have to really look at each one individually, if you're interested.